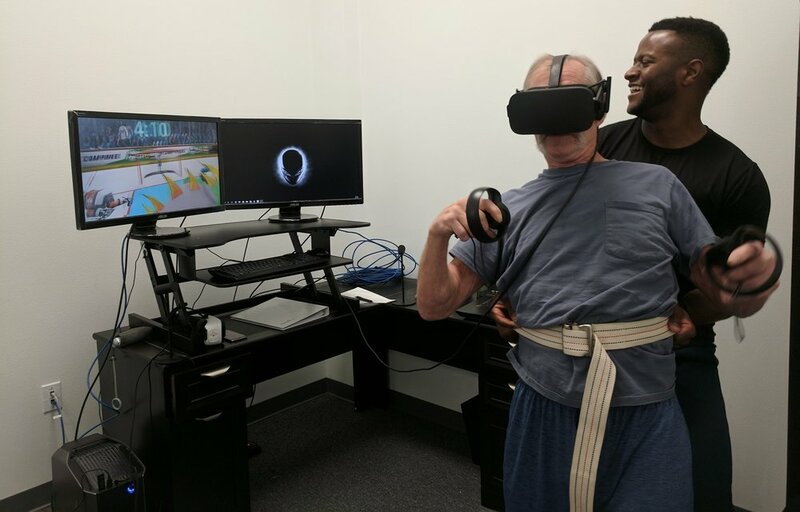 At the Neurological Recovery Center(NRC), the largest robotic rehabalitation clinic in the United States, Virtual Reality games have become a daily part of therapy sessions for most patients here. The therapists at the clinic have learnt to wield a gaming laptop with ease, wear a VR headset and troubleshoot games for the patients, without any extra help from a tech nerd needed. The amazing therapists at the clinic all know how to wield a gaming laptop, wear a VR headset and launch the games, without the help of a tech nerd hovering over their shoulders. They also help their patients play the games and keep track of their progress. For the therapists, the transformation from, “I don’t want to touch this VR headset because I might break it” to “This is easy and my patients love it!” did not happen overnight. VR was introduced to the clinic, with the first in-house app called LokoSprint, specifically created for the Lokomat robotic system, one of the many high end therapy technologies at the clinic. The initial response from the therapists and the patients, as for any first time VR experiencer was that it blew their mind. But at Neuro Rehab VR , it isn’t just about the wow factor that comes with Virtual Reality. The fun and engaging games are a way to help them recover and progress in a consistent manner. Therapists bring in the patient to a VR station, which contains a gaming laptop and VR system attached (Oculus/HTC Vive). They seat the patient on a chair, or stand at the blue “X” mark on the floor indicating the center of the tracked space, help them wear the headset, and open a world of new possibilities for therapy and fun at the same time. The integration of VR into daily therapy sessions, was not an easy road, but it has been quite successful. Now that VR has become a part and parcel of the therapy lifestyle at the clinic, we decided to have a friendly, casual interview with two of our amazing therapists at the clinic as well as one of our senior patients who plays VR games regularly (yes, they love it too) to learn their thoughts about its usefulness for therapy in practice. Their responses were so good, that their audio recording has been shared at the bottom, so that their point of view can be seen as therapists, embracing this new technology and making it happen for their patients. Enjoy! Randall Williams, a DPT at Neurological Recovery Center, loves the immersion that comes with virtual reality. According to him, it gives patients the cognitive aspect of something that they cannot do in the real world, which “does wonders for their body”. People who cannot grab things easily in the real world, due to lack of grip or fine motor skills, could duplicate the sensation in an immersive environment. All of Randall’s patients who have used virtual reality have had nothing but good things to say about it. They think that it contributes to their therapy, and is deeply beneficial to it. Randall finds the contraindication sad, that a lot of his patients who are seizure prone would actually benefit the most from virtual reality. (Due to the flashing graphics inside a virtual reality headset, people prone to seizures are not recommended to use such headsets). Arik Hunter Yates, a PTA at NRC, when asked why he likes VR for his patients had many positive things to say. He says that it allows him to do therapy exercises for his patients that he would have a lot more difficulty replicating in the real world. It distracts the patients from their immediate surroundings, and immerses them in a world where they have goals to reach. From his point of view,the game mechanics leads the users to instinctively move their arm or body, allowing for further muscle recruitment while playing, rather than focusing on moving their arm consciously. The latter sometimes leads to muscle tone and stiffness, causing frustration and disappointment for the patient, which is why virtual reality gets another plus point. According to both therapists, the patients love the environments where they can perform tasks that they could not in real life. These include brandishing swords in a virtual reality version of Fruit Ninja, or picking up objects at a grocery store in an in-house app called Retail Therapy. In Retail Therapy, the user has to extend their hand out to an object, keep it there for a prolonged period of time, and then return back to their initial position, which is highly similar to what patients have to do in actual physical therapy. In Randall’s point of view, this is a great way to showcase how therapists could use virtual reality to enhance the exercises in physical therapy. One of the patients at the clinic, who trains in VR regularly, mentions a game he loves to play, where the user has to move continuously to punch a virtual hockey player and block punches from the same. He states that games like these trick him into exerting more than he would in a real life environment, devoid of virtual reality. According to Arik, virtual reality could benefit patients from the start of their therapy, all the way till they have to be discharged. He conditionally states that spinal cord patients who do not have proper grip control, but have to use gripping aids to help them hold the controllers, still benefit from the virtual reality environment. From immersive environments, to the actual weight of the headset lending to dynamic head control, virtual reality seems to be hugely helpful to the patients for now. The therapists look forward to seeing more innovations using VR, especially if combined with the multiple machines in the center currently.